Twin impact craters, which are formed simultaneously by two separate, but probably related, meteorite impacts, are very rarely recognized on Earth. This pair is situated in crystalline bedrocks of the Canadian Shield. 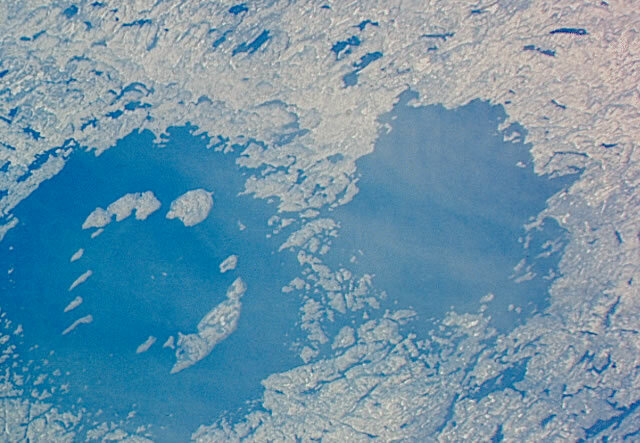 The larger Clearwater Lake West (left) shows a prominent ring of islands that has a diameter of about 10 kilometers. They constitute a central uplifted area and are covered with impact melts. The central peak of the smaller Clearwater Lake East (right) is submerged.